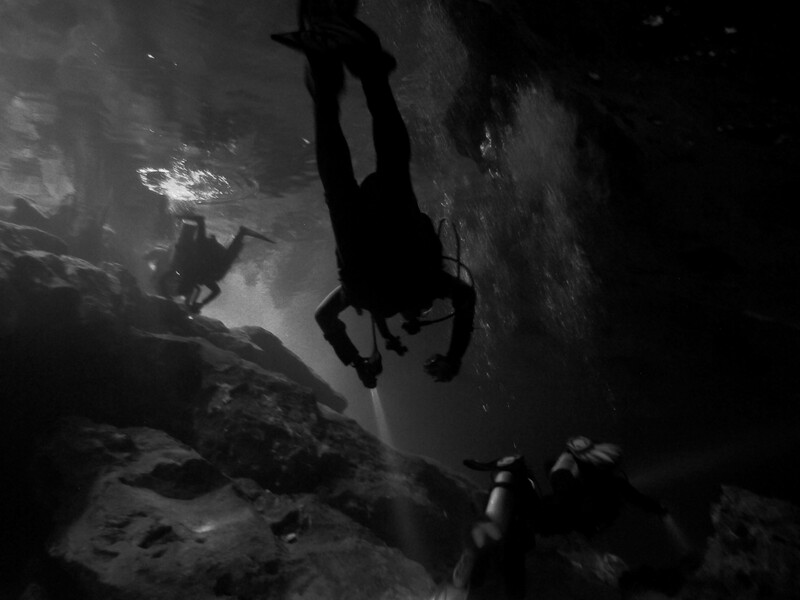 Diving is one of my greatest passions. 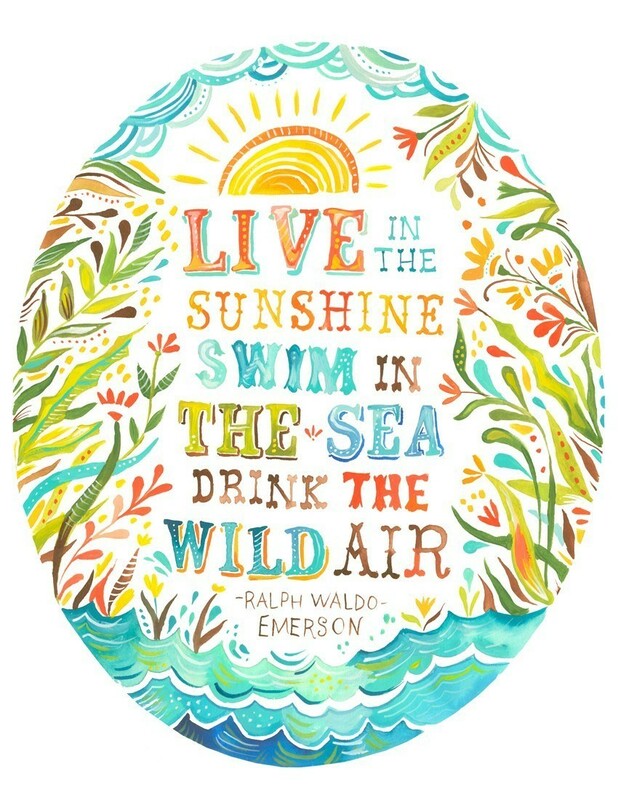 I love being able to explore the underwater world and experience the beauty and biodiversity it has to offer. 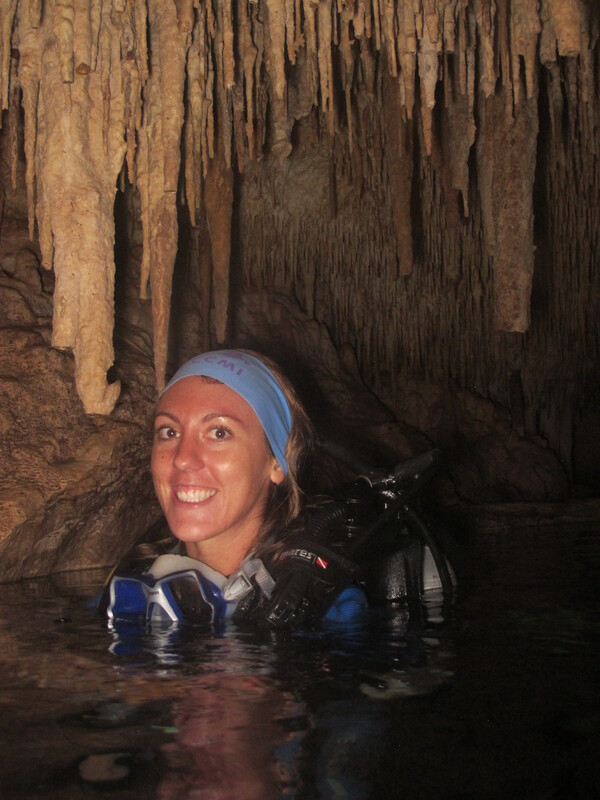 Here in my blog I will share any memorable dives, discuss top dive sites and any interesting diving news from around the world. To begin with, I will explore the beauty of the Bloody Bay Wall on Little Cayman, one of the world’s best dive sites. Below is a picture taken of me on the dive site Great Wall West on Bloody Bay Wall. Bloody Bay Wall is located on the North side of Little Cayman and is located in Bloody Bay, named after a famous pirate battle and the colour of the lagoon after shore run-off. 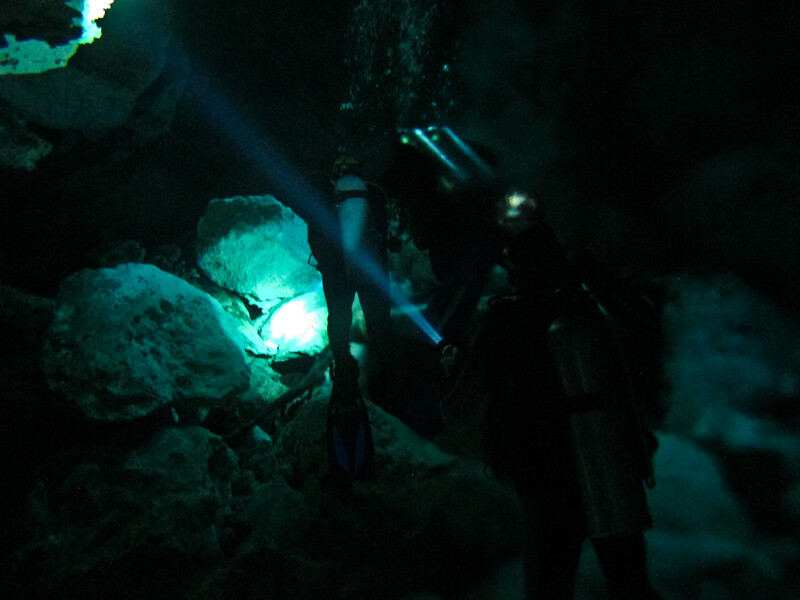 The sea floor surrounding Little Cayman ends sharply around 5-10 m, dropping off to over 1800 m. Bloody Bay wall offers some of the best wall diving in the world, supporting a diverse abundance of marine life. The wall itself provides the substrate for hard and soft corals, sponges, cnidarians, mollusks and much more. 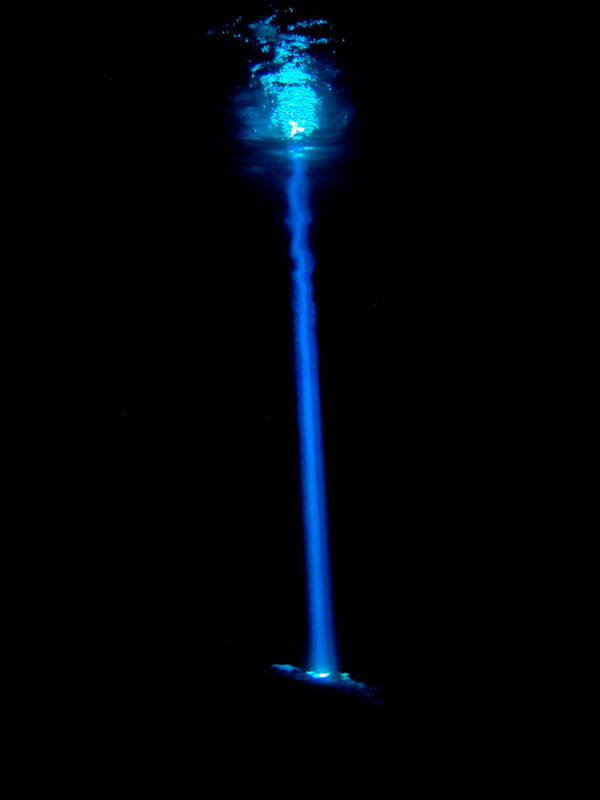 The sheer drop off of the wall also means that larger marine life such as sharks, turtles and rays are frequently spotted in the blue. Every now and then, divers are lucky enough to see whale sharks, hammer heads and mantas. To-date Bloody Bay Wall rates on my top 10 dive sites due to the sheer drop off of the wall and the amount of life it supports. On one dive I had four Caribbean reef sharks just cruising underneath me in the deep and a friendly Nassau grouper as an additional dive buddy. Anyone visiting this dive site should take the time to swim off of the wall into the blue and look back so you can take in the enormity of the drop-off. 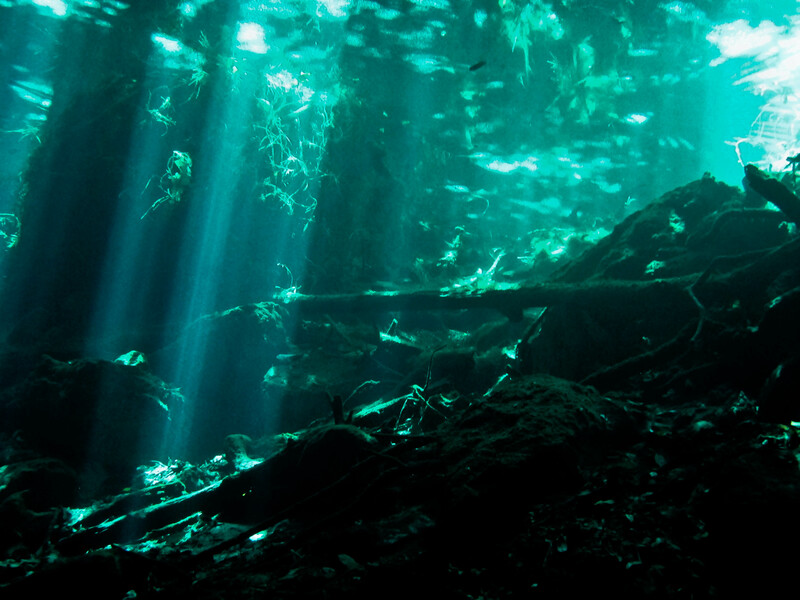 Cenotes are a deep natural sink hole that are filled with fresh water. 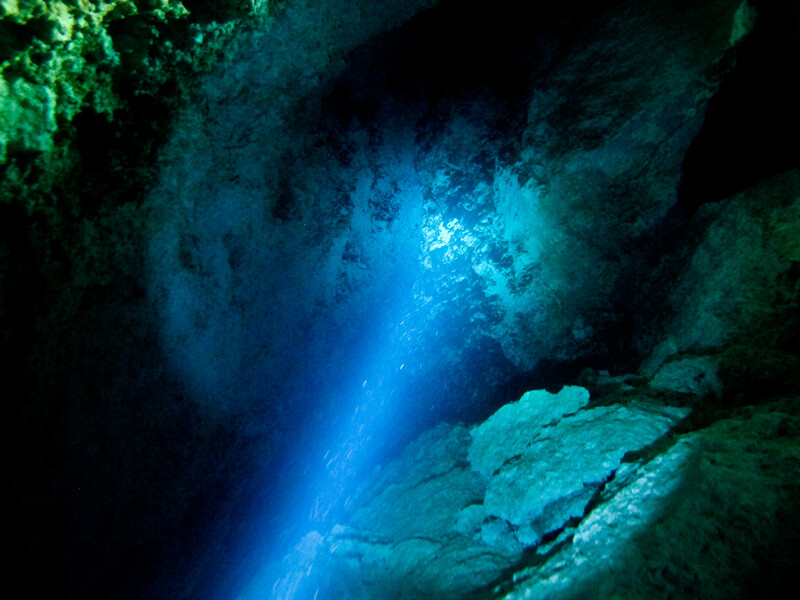 In certain areas saltwater can enter the Cenote forming a halocline that is visible during a dive. 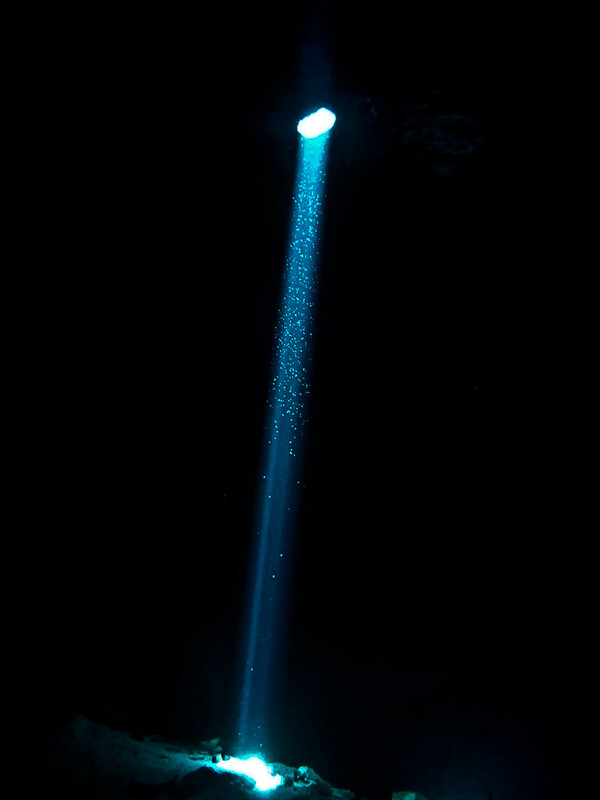 A halocline is a sharp change in salt concentration over a small change in depth which results in a blurry visual effect caused by refraction between the different densities of fresh and saline waters. 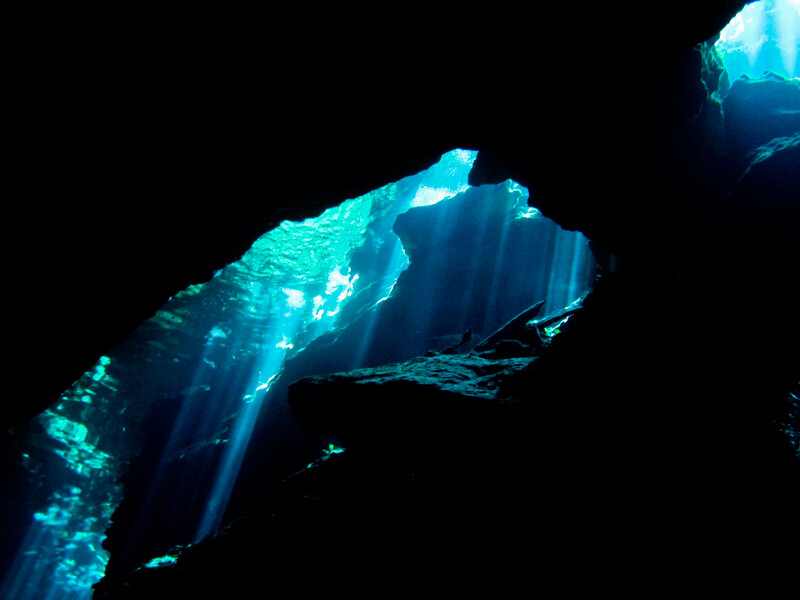 The Cenote I visited was called the Chac Mool and it was truly incredible. 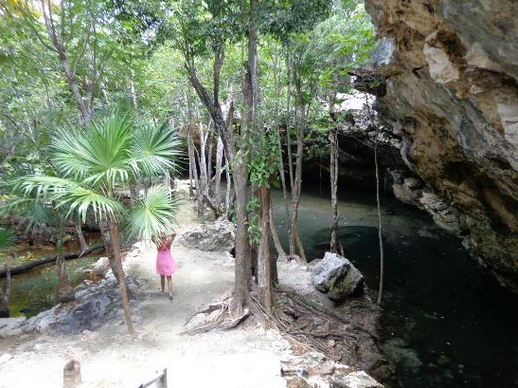 After a two hour drive from Cancun,we entered onto a private property in the middle of the jungle. We set up our gear and walked down to a small body of water (see image below). 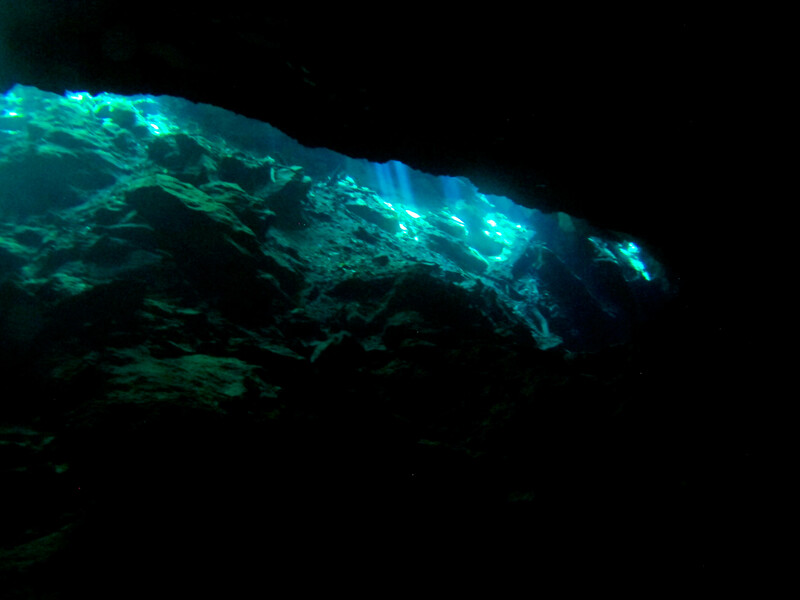 This small body of water leads into an underground network of caves. 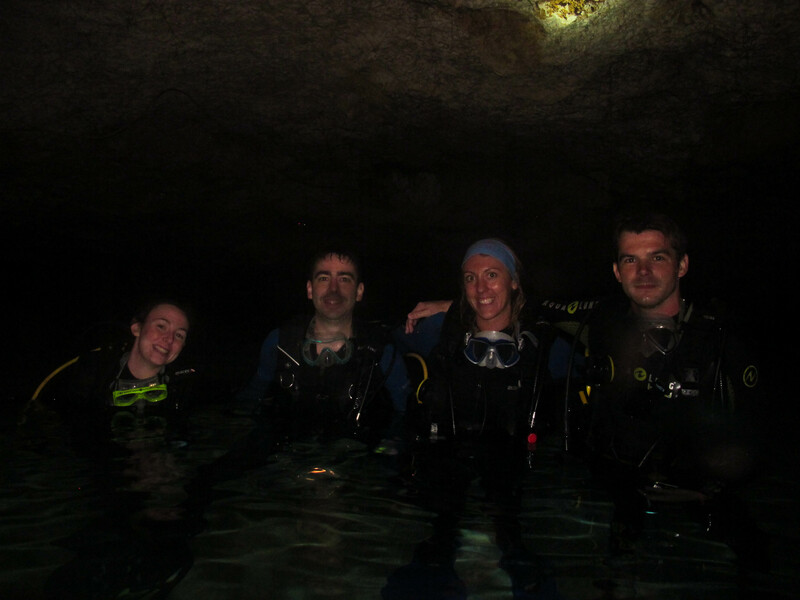 Our dives were incredible! 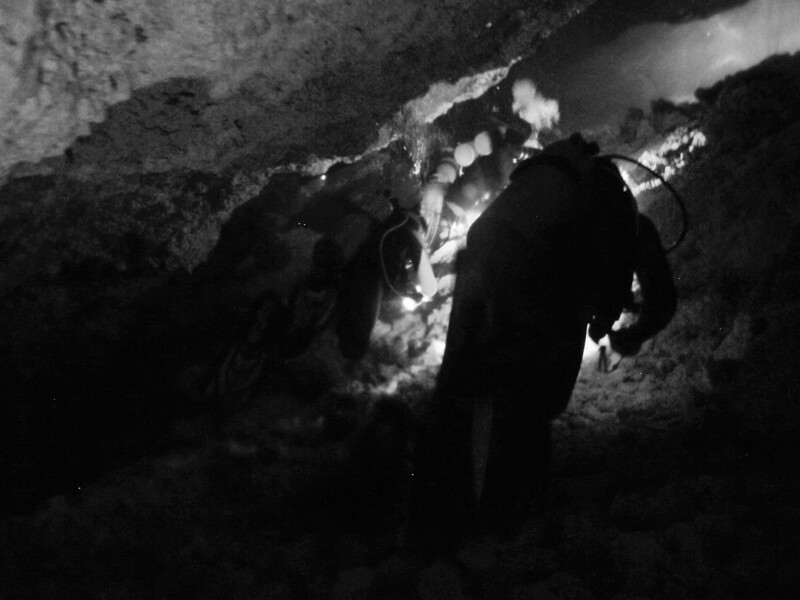 Entering into the cave network we left behind daylight and relied on our torches for orientation as we followed guidelines into the cavern network. 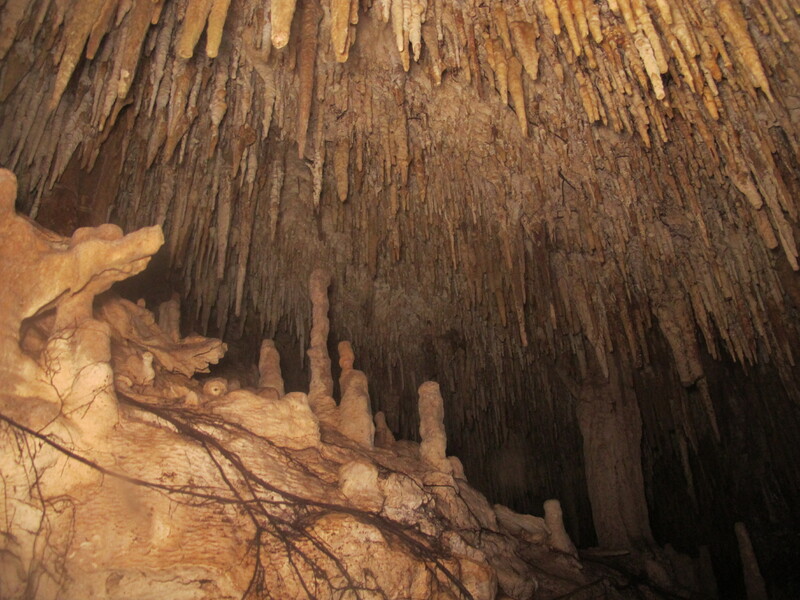 Approximately 1,700 feet into the cave network we reached a large room which contained a giant stalactite named Xich Ha Tunich (“Giant Drip Stone” in Mayan). 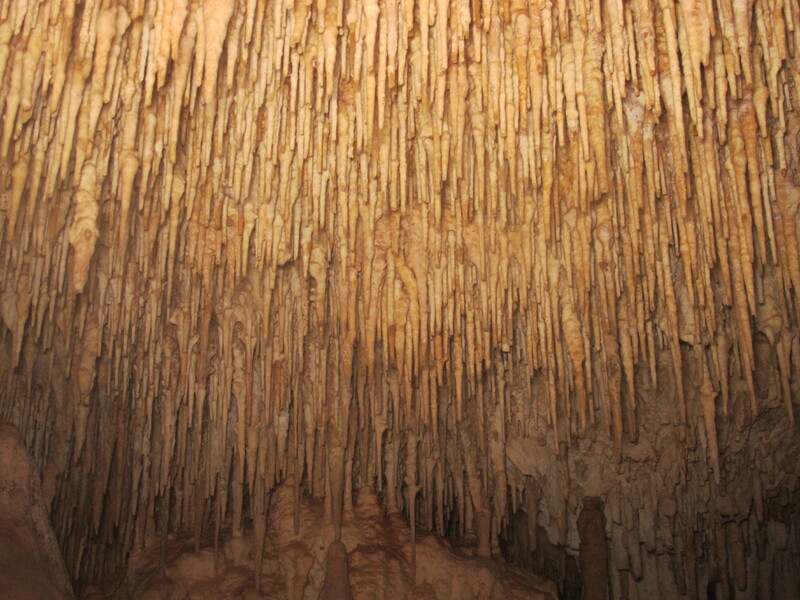 In the cavern network we also saw a lot of fossilized corals and shells. These really were some unforgettable dives and the pictures below do not do them justice, but I hope you enjoy them!